Marble bust of Brutus, National Museum of Rome. Marcus Junius Brutus (early June 85 BC – late October 42 BC), usually referred to as Brutus, was a politician of the late Roman Republic. He is best known for his leading role in the assassination of Julius Caesar. Brutus' father was killed by Pompey the Great after he had taken part in the rebellion of Lepidus. His mother was the half-sister of Cato the Younger, and later became Julius Caesar's mistress. Some sources refer to the possibility of Caesar being his real father. His uncle adopted him in about 59 BC. Brutus held his uncle in high regard. His political career began when he became an assistant to Cato, during his governorship of Cyprus. During this time, Brutus enriched himself by lending money at high rates of interest. He returned to Rome a rich man, where he married Claudia Pulchra. From his first appearance in the Senate, Brutus aligned with the Optimates. This was the conservative faction against the First Triumvirate of Marcus Licinius Crassus, Gnaeus Pompeius Magnus and Gaius Julius Caesar. When civil war broke out in 49 BC between Pompey and Caesar, Brutus followed his old enemy and present leader of the Optimates, Pompey. When the Battle of Pharsalus began, Caesar ordered his officers to take him prisoner if he gave himself up voluntarily, and if he persisted in fighting against capture, to let him alone and do him no violence. After the disaster of the Battle of Pharsalus, Brutus wrote to Caesar with apologies and Caesar immediately forgave him. Caesar then accepted him into his inner circle and made him governor of Gaul when he left for Africa in pursuit of Cato and Scipio. In 45 BC, Caesar nominated Brutus to serve as urban praetor for the following year. Also, in June 45 BC, Brutus divorced his wife and married his first cousin, Porcia Catonis, Cato's daughter. According to Cicero the marriage caused a semi-scandal as Brutus failed to state a valid reason for his divorce from Claudia, except that he wished to marry Porcia. The marriage also caused a rift between Brutus and his mother, who resented the affection Brutus had for Porcia. Around this time, many senators began to fear Caesar's growing power after his appointment as Dictator for life. Brutus was persuaded into joining the conspiracy against Caesar. Eventually, Brutus decided to take action against Caesar. His wife was the only woman who knew about the plot. The conspirators planned to kill Caesar on the Ides of March (March 15) that same year. On that day, Caesar was delayed going to the Senate because his wife tried to convince him not to go. The conspirators feared the plot had been found out. Brutus persisted, however, waiting for Caesar at the Senate, and allegedly still chose to remain even when a messenger brought him news that would otherwise have caused him to leave. When Caesar finally did come to the Senate, they attacked him. The conspirators attacked in such numbers that they even wounded one another. Brutus is said to have been wounded in the hand. After the assassination, the Senate passed an amnesty on the assassins. This amnesty was proposed by Caesar's friend and co-consul Mark Antony. Nonetheless, uproar among the people caused Brutus and the conspirators to leave Rome. Brutus settled in Crete from 44 to 42 BC. 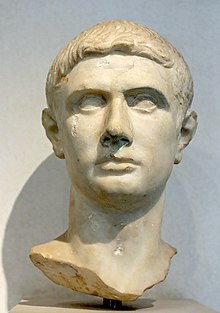 In 43 BC, after Octavian received his consulship from the Senate, one of his first actions was to have the people that had assassinated Julius Caesar declared murderers and enemies of the state. Cicero, angry at Octavian, wrote a letter to Brutus explaining that the forces of Octavian and Mark Antony were divided. Antony had laid siege to the province of Gaul, where he wanted the governorship. In response to this siege, Octavian rallied his troops and fought a series of battles in which Antony was defeated. Upon hearing that neither Antonius nor Octavian had an army big enough to defend Rome, Brutus rallied his troops, which totalled about 17 legions. When Octavian heard that Brutus was on his way to Rome, he made peace with Antony. Their armies, which together totaled about 19 legions, marched to meet Brutus and Cassius. The two sides met in two engagements known as the Battle of Philippi. The first was fought on 3 October 42 BC, in which Brutus defeated Octavian's forces. Cassius was defeated by Antony, and committed suicide, because he thought Brutus had also failed. The second engagement was fought on 23 October 42 BC and ended in Brutus' defeat. After the defeat, he fled into the nearby hills with only about four legions. Knowing his army had been defeated and that he would be captured, Brutus committed suicide. Antony, as a show of respect, ordered Brutus' body to be wrapped in his most expensive purple mantle, which was later stolen. Antony had the thief executed. Brutus was cremated, and his ashes were sent to his mother. 85 BC: Brutus was born in Rome to Marcus Junius Brutus The Elder and Servilia Caepionis. 58 BC: He was made assistant to Cato, governor of Cyprus which helped him start his political career. 44 BC: A ring-leader in the assassination of Julius Caesar; then went to Athens and then to Crete. 42 BC: Lost the Battle of Philippi to Mark Antony's forces. The well-known phrase "Et tu, Brute?" ("And you, Brutus?") is famous as Caesar's last utterance in Shakespeare's play Julius Caesar. The reason for the remark was that Caesar had thought him a friend. ↑ Plutarch, Life of Brutus, 5.2. ↑ Plutarch, Life of Brutus, 2.1. ↑ Plutarch, Life of Brutus, 3.1. ↑ Cicero: ad Fam. iii. 4. ↑ Plutarch, Life of Brutus, 5.1. ↑ Plutarch, Marcus Brutus, 13.3. ↑ Cassius Dio, Roman History, 44.8.4. ↑ Cassius Dio, Roman History, 44.12.2. ↑ Cassius Dio, Roman History, 44.12.3. ↑ Plutarch. Marcus Brutus. 15.1. ↑ Cassius Dio. Roman History. 44.18.1. ↑ Plutarch. Marcus Brutus. 15.5. ↑ Plutarch. Marcus Brutus. 17.7. ↑ Nicolaus of Damascus. Life of Augustus. 24. ↑ Plutarch, Marcus Brutus, 52.1-53.4. This page was last changed on 18 December 2016, at 07:16.